Liberty Kitchen's Super Bowl Party Pack. Photo by Carla Gomez. The Super Bowl isn’t just about football. It’s also about hosting parties and setting the table with a bunch of great, snackable foods, like hot wings, tacos and pizza. Of course in Houston, there are so many great options that it’s also fun to get off the beaten path and take advantage of what the diverse restaurants have to offer. That’s right: no need to spend all Saturday in the kitchen. Just send in your order to an area restaurant, pick up and then take all the credit for the delicious spread. Here are some picks that should score, whether you’re watching the game or are secretly just in it for the annual over-the-top, celebrity-laden ads. The Union Kitchen, 4507 Bellaire: Pick up big servings of popular game day foods for $20 each, including 20 barbecue meatballs or a veggie tray loaded with broccoli, celery and carrots with ranch dressing. Wings cost $25 for 30 bone-in or $20 for 30 boneless. For something different, switch it up with skewers: 25 beef skewers are $30 and 30 chicken are $20. Pizza squares cost $10 for cheese, $12 for Margherita and $13 for Hawaiian; each order contains 25 squares. All orders must be placed by Thursday, January 31. To order, call (713)-661-0025. Beaver’s, 6025 Westheimer: Snag grab-and-go racks of ribs for $23 in addition to three different party packs designed to feed a big crowd. The latter include the following combinations: two pounds each of sliced beef brisket, jalapeño cheese sausage and pulled pork, two dozen mini meatballs, a half-pan of macaroni and cheese and more for $295; a quart of queso and chips, a dozen beef empanadas, one dozen beaver tails, three dozen Bid Daddy Beaver Wings (choice of sticky bourbon, buffalo or barbecue flavors), a dozen sliders and two dozen mini beaver balls for $175; and a quart of queso and guacamole with chips, two dozen beaver burger sliders and mini Beaver Balls, four dozen Bid Daddy Beaver Wings and a half-pan of macaroni and cheese for $275. Those who just need to feed a few might instead take a look at the grab-and-go rack of pork spare ribs for $23. All orders must be placed by Friday, February 1 and be picked up on Sunday, February 3. To order call (713)-714-4111. Revival Market, 550 Heights: There’s a special game-day menu available, including crowd-pleasing options like chicken wings for $15 per dozen with a two dozen minimum, a three-foot hoagie stuffed with turkey, ham, roast beef and cold cuts that feeds six to eight people for $50 and charcuterie and cheese plates for $9 per person. Alternatively, order a whole or half roasted pig with pickles, onions, barbecue sauce, rolls and two sides for $25 per person. To order, email [email protected] or call (713) 880-8463. Get grill-ready selections for game day from the Butcher Shop at B&B. Photo by Felix Sanchez. The Butcher Shop at B&B Butchers, 1814 Washington: The popular steakhouse butcher shop has an entire Game Day Grub menu featuring selections like ready-to-roast tenderloin for $33.99 per pound, Texas Wagyu hotdogs for $13.99 per pound and 10-ounce burger patties for $7.99 per pound. The Signature Sandwich Platter includes a choice of the B&B Special Italian Hero, The Trinity, Ham and Swiss on white bread, B&B Roast Beef on multigrain bread or B&B Turkey on white bread. Platters come with deli pickles, house chips, coleslaw, pesto pasta salad and assorted cookies. (Brownies are available for an additional $3 per person.) The cost for a platter is $15 per person with a 10 person minimum. Twenty-four hours’ notice is required for orders. Call (832) 767-4828 to order. The Charcuterie and Cheese Platter from Antone’s Famous Po’ Boys serves up to 15 people. Photo courtesy of Antone’s Famous Po’ Boys. 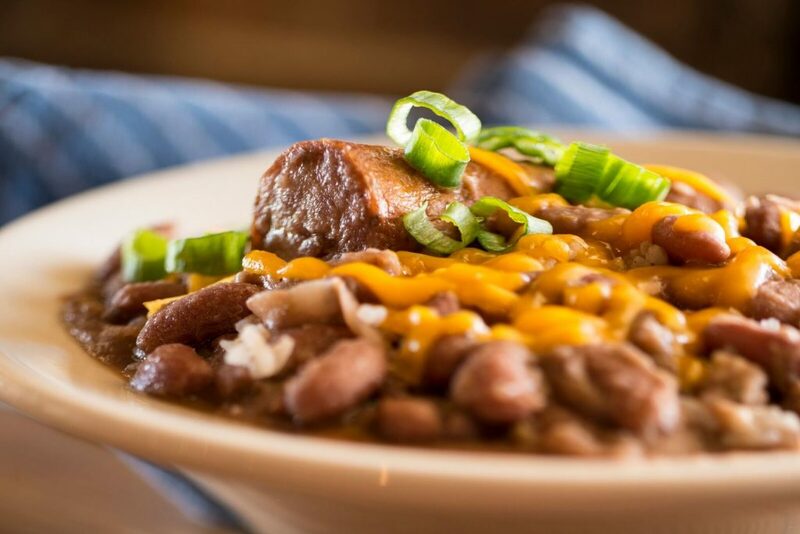 Antone’s Famous Po’ Boys, 4520 San Felipe: This Houston mainstay for sandwiches, hot dishes and sides has a host of Party Platters packed with meats, cheeses and other munchies. 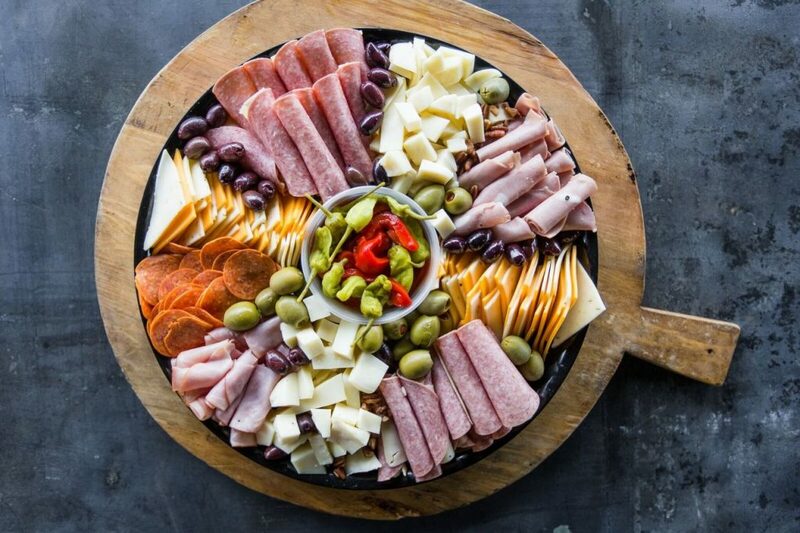 The Charcuterie and Cheese Platter comes with Chef’s Choice of selections that may include salami, mortadella, ham, bleu cheese, Brie, cheddar, pepper jack, provolone and Swiss, as well as olives, grapes, bread and crackers. It serves 10 to 15 people. Another option is the Mediterranean Platter with stuffed grape leaves, green and Kalamata olives, roasted red peppers, tabbouli, feta cheese and hummus served with toasted pita bread. It serves 10 to 12 people. All party platters are $53 and must be ordered at least 24 hours in advance. Both delivery and pickup options are available. To order, call (713)-623-4464 for the 4520 San Felipe location and (713)-686-4338 for the 2724 West TC Jester location. 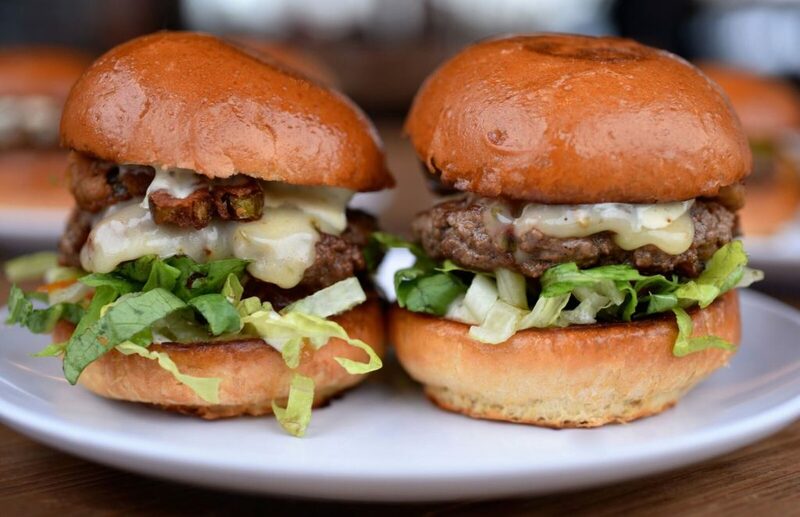 Bernie’s Burger Bus has a party pack of 26 sliders to liven up a gathering for the big game. Photo by Kimberly Park. Bernie’s Burger Bus, multiple locations: The local Houston chain is selling a Super Bowl Sunday Burger Box with 26 sliders. Choose from Pre-Schoolers (mini cheeseburgers topped with mustard, housemade ketchup and pickles), Pep Squad, Bacon-BBQ-Cheddar or Kindergarteners (bleu cheeseburgers topped with bacon and onions). Optional add-on electives (toppings) are available. Orders also include housemade S+P kettle chips and a pint of housemade French onion dip. The cost is $100 and the restaurant recommends ordering ASAP. Guests must pick up orders by 7 p.m. on game day. Order via email. Demeris BBQ, 2911 South Shepherd and 1702 West Loop North: This classic Houston barbecue joint has an array of delivery and pickup options for small and large groups. Custom orders are encouraged, but the most popular package is the restaurant’s “standard” option. It includes sliced beef brisket, sausage, barbecue sauce, beans, potato salad, sliced French bread, jalapeños and onions. The cost is $9.95 per person for groups of 10 to 29 people; rates decrease for larger groups. View the full catering menu online and order by calling (713)-529-7326. Dish Society has plenty of game day offerings, including a tray of grilled chicken pesto sandwiches. Photo by Dragana Harris. 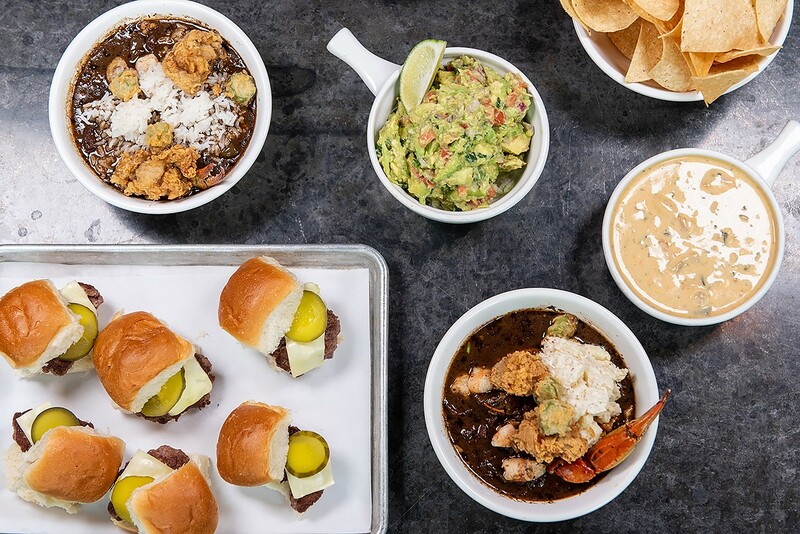 Dish Society, multiple locations: The Super Bowl Sunday offerings from this homegrown Houston chain with an emphasis on local ingredients include a 44 Farms Chimichurri Taco Bar to-go with 44 Farms steak, cabbage slaw, housemade chimichurri sauce and cotija cheese on flour tortillas. It costs $85 for seven servings or $170 for 14 servings. There’s also shrimp and grits featuring grilled Gulf shrimp with smoked Gouda cheese bacon grits and Tabasco shallot butter that costs $115 for seven servings or $230 for 14 servings. 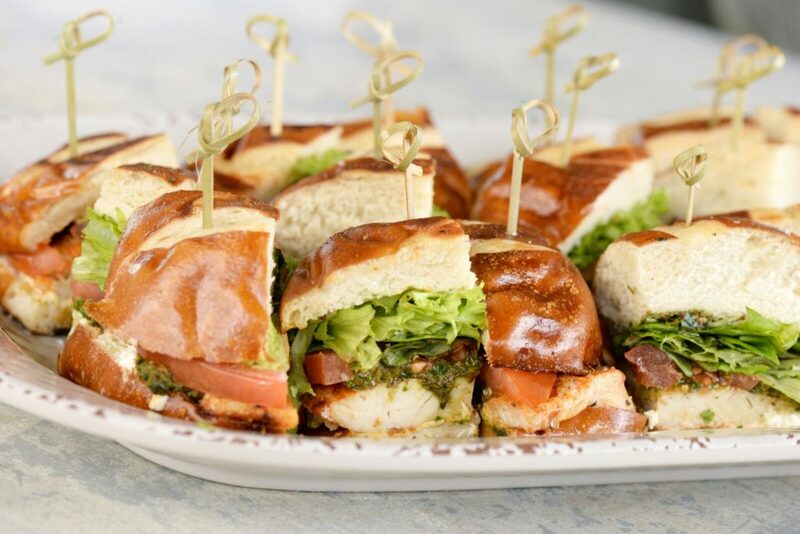 The restaurant also has several sandwich tray options, including Grilled Pesto Chicken Sandwiches made with grilled, cage-free chicken, Texas pecans, basil pesto, Texas goat cheese, tomato and organic greens on a pretzel bun. It costs $60 for seven servings is $60 or $120 for 14 servings. To order, call (832) 856-1873. Fajita Pete’s, multiple locations: For game day, there’s a $53 party pack that comes with a half-gallon of margaritas, one pound of fajitas and queso. The deal is available for pick up or delivery. To place an order, call the nearest preferred location. 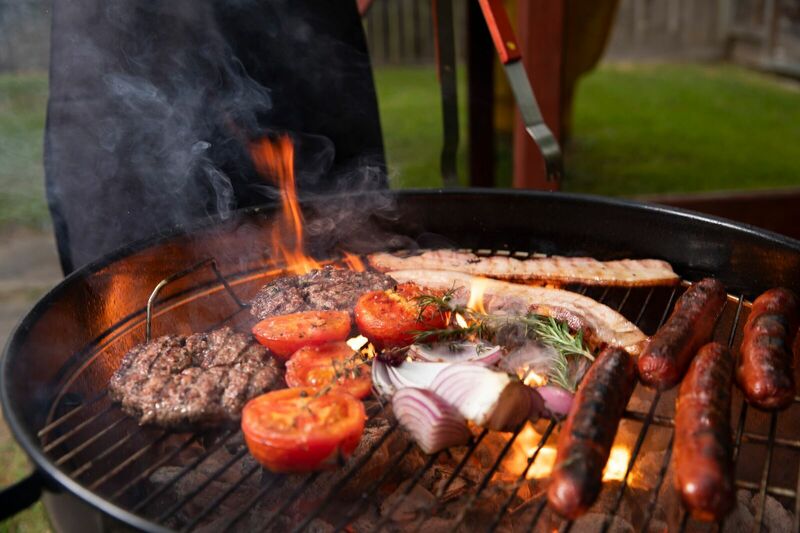 Goode Company BBQ, multiple locations: Most locations are offering party pack options that feature burgers or barbecue and these are available for pick up or delivery. Choose the Backyard Party Pack that comes with enough food for 20 people and includes burgers and toppings of lettuce, tomato, onions, ketchup, mustard and mayo. The chuck burger option is $135 plus tax, while the chicken burger pack is $150 plus tax. The barbecue party packs include a choice of beef brisket, sausage, chicken (choose a whole chicken or one pound of meat), pork ribs, honey smoked ham, turkey breast or spicy pork and a choice of side order from a selection of potato salad, jalapeño pinto beans, Austin baked beans, cole slaw or Jambalaya Texana. Each is available with three, five, eight, 20 or 25 pounds of meat. Prices range from $55 to $635. Orders must be made 24 hours in advance and can be placed by calling (713) 520-9153. Pickup is available at all Goode Company BBQ locations. Liberty Kitchen’s Super Bowl Party Pack. Photo by Carla Gomez. Liberty Kitchen, multiple locations: All three of the F.E.E.D TX restaurants are preparing Super Bowl party packs to-go this year. The Game Day Party Packs come in two sizes: the Field Goal, which serves four to eight for $100 and the Touchdown size, which serves 8 to 12 for $170. The packs include Jumbo Wings with Hedge Ranch and Hot Sauce Syrup; Shrimp, Sausage and Short Rib Gumbo served with French bread and either potato salad or rice; Mini-Burger or Chicken Sliders, chile con queso, chunky avocado dip and warm tortilla strips. Orders must be placed online by Friday, February 1 at noon and picked up on Sunday, February 3 by 2:00 p.m. All Liberty Kitchen locations are closing at 4 p.m. on Super Bowl Sunday. Treebeards famous red beans and rice is part of a party pack that feeds 10. Photo courtesy of Treebeard’s. Treebeards, multiple locations: Add some New Orleans flair to your Super Bowl partying with Treebeards’ Super Bowl Special. This party pack includes chicken and sausage gumbo, red beans and rice with sausage and accompaniments of cheddar cheese, green onion and Treebeards’ hot sauce. It feeds 10 people and costs $100 ($120 to add jalapeño cornbread). To order, call 713-228-8228 and pick up at the location of your choice on Friday, February 1.